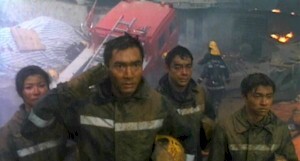 The Skinny: Johnnie To's generously human answer to Ron Howard's Backdraft. Hong Kong’s answer to Backdraft is a good, solid flick that seems to contain most of Johnnie To’s favorite actors and themes. Thankfully, he neglects to add montages. Lau Ching-Wan is the risk-taking boss fireman of the “ill-fated jinxes,” a notoriously unlucky squad of lifesavers. They’re known for futility and things just going wrong, i.e. failing to save lives or saving the wrong ones (like pets, for example). However, through teamwork and perseverance, they gain each other's trust and the respect of others. There’s no real plot here, just a lot of incidents as the characters find themselves among all the goings on at the firehouse. The first hour of the film is a lot of back of forth, as the characters move forward, fall back, experience doubt, pain, elation, and all sorts of other recognizably human emotions. Finally, in a harrowing forty-five minute rescue sequence, they tackle one of the most amazingly staged fire sequences put on film. Despite a massively smaller budget than Ron Howard's Backdraft, To outdoes its Hollywood counterpart with realism and sheer bravura storytelling.